SINOI makes all its own original models and moulds, in order to apply its expertise gained from the serial production of rotor blades to the construction of the moulds. The process of constant improvement ensures an ongoing increase in the quality and efficiency. Regarding the built-to-print production of rotor blades losses in quality can bei avoided since we construct own moulds. 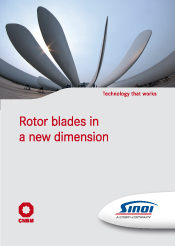 The rotor blade moulds of SINOI enable effective rotor blade production. The high number of demouldings minimise the investment costs, and the high quality of the moulds streamlines the production process. Thus, high costs resulting from downtime will be avoided and agreed delivery dates can be met reliably. The application of the RIM technology when making the moulds ensures long-term security of investment in the required tools.